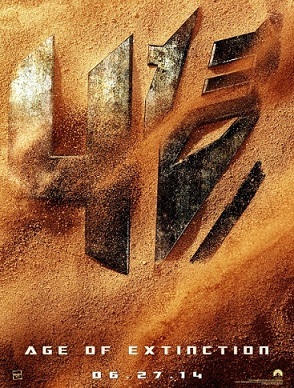 It looks as if Michael Bay's next Transformers installment has an official title and teaser poster. Considering the title is Transformers: Age of Extinction, having dinobots makes a bit of sense. Presumably taking place in both the now and, I would guess, prehistoric times- to cover the extinction part of things. It would be interesting to see fan-favorite Grimlock fighting a bunch of T-Rexs. "I cannot disclose the specifics, but you can be sure that the arrival of the Dinobots will give the audience a lot to be excited about," said Producer Lorenzo di Bonaventura. What we know other than this small new information is that Mark Wahlberg is replacing Shia LaBeouf in the leading role, and that the always amazing Stanley Tucci, as well as Kelsey Grammer, Sophia Myles, T.J. Miller, and Nicola Peltz also star. It's good to see news that isn't about Mr. Bay damaging the Ninja Turtles' reputation! The film is set to be released on June 27, 2014.